Jean-Bédel Bokassa, longtime dictator and military leader of the Central African Republic, was born in Bobangui, Oubangui-Chari, French Equatorial Africa (present-day Central African Republic) on February 22, 1921. Bokassa’s father, a village chief of the Mbaka people, was murdered in November 1927 for refusing to provide labor from his village as required under French colonial rule. A week later, his mother committed suicide and Bokassa, aged 6, became an orphan. Missionnaries took in Bokassa and raised him until he joined the French colonial army in 1939, at the beginning of World War II. He then took part in the 1944 landings in Provence, France, and subsequently served with the French Army in Indochina and Algeria. A skilled soldier, Bokassa rose to the rank of captain. He also won the Legion d’Honneur, the highest French military decoration and the Croix de Guerre, which was presented to soldiers who distinguished themselves in combat. After Oubangui-Chari became the independant Central African Republic in 1960, Bokassa helped to establish its army and was named colonel in 1964 by President David Dacko. Quickly rising to Army Chief of Staff, Bokassa seized power from President Dacko in 1965 in a coup d’état and ruled the country autocratically for the next 14 years. Bokassa’s regime was supported by French military and economic aid. In 1972, Bokassa proclaimed himself president for life. His political opponents were executed and the national economy devastated to sustain his extravagant personal lifestyle. In 1976, Bokassa renamed the country the Central African Empire and proclaimed himself Emperor Bokassa I. Although most of the world condemned his proclamation, the coronation was backed by French President Valéry Giscard d’Estaing. In 1979, Bokassa passed a regulation forcing high school students to purchase uniforms, only available from a factory owned by his wife. Due to the ensuing violent student demonstrations, Bokassa ordered many of the protestors imprisoned. Over 100 children were massacred while incarcerated. International organisations and foreign governments responded by condemning Bokassa for the murders and international organizations cut off aid. While he had travelled to Libya to seek for other financial support, the French orchestrated another coup which returned David Dacko to power as the Central African Republic’s president in September 1979. 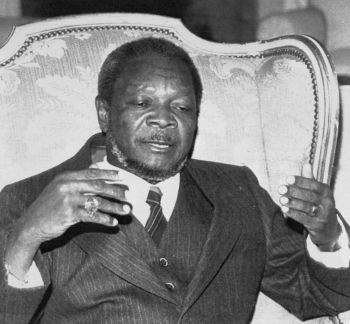 Bokassa, condemned to death in absentia, went in exile in Côte d’Ivoire and France. In 1986, Bokassa returned to the Central African Republic to be sentenced to death on the charge of murder. Seven years later, in 1993, President Andre Kolingba pardoned Bokassa and released him from prison. Bokassa died in 1996 in Bangui, capital of the Central African Republic. “Bokassa, Jean-Bédel,” in Kwame Anthony Appiah and Henry Louis Gates, Jr., eds., Africana: the Encyclopedia of the African & African American Experience (New York: Oxford University Press, 2005); “Central African Republic: Nationalism, Independance,” in Kevin Shillington, ed., Encyclopedia of African History (New York: Fitzroy Dearborn, 2005).